Three Blackpool players have been dropped from the squad to face Sheffield Wednesday after being spotted dancing in a local nightclub. Boss Ian Holloway took action after Barry Bannan, Ishmel Demontagnac and Neil Eardley were seen out just hours after Saturday's 2-1 loss to Leicester. "I'm disappointed - we'll have a party once we've got 52 points," Holloway told BBC Radio Lancashire. "If they think that's appropriate, then they're messing with the wrong man." The trio will avoid a fine because they have not broken the terms of their contracts but Holloway will ask them to explain their behaviour. "They're not in breach of contract - they've broken my rules and I think our fans need to know," he said. How can you be injured and be dancing? 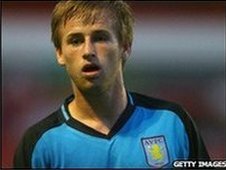 Holloway revealed Eardley has been nursing a knee problem while Bannan, who is on-loan from Aston Villa, has a foot injury. The pair were due to undergo treatment on Sunday. "Bannan's probably broken his toe but it was apparently good enough to go out dancing on a Saturday night," said Holloway. "How can you be injured and be dancing? "I like a dance with anybody but it's got to be the right time and when you're in a good mood. "I'm not in a good mood when I lose and neither should they be."